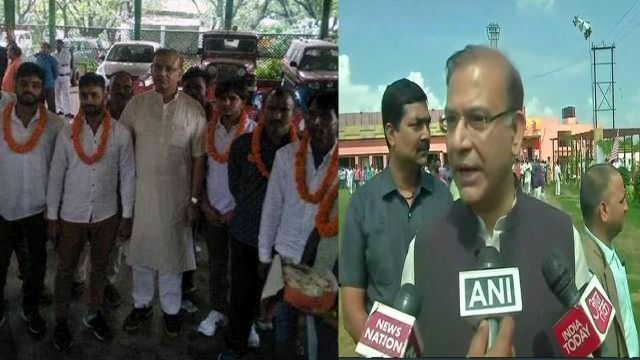 New Delhi : Minister of State for Civil Aviation Jayant Sinha, who has come under sharp attack from the opposition for meeting and garlanding eight convicts of a lynching incident in his Lok Sabha constituency in Jharkhand, on Wednesday expressed regret for his act. “I have said many times that the matter (of lynching) is still sub judice. It won’t be fair to talk on this. Law will take its own course. We have always worked towards punishing the guilty and sparing the innocent. If by garlanding them (the lynchers) an impression has gone out that I support such vigilantism then I express regret over it,” Jayant Sinha was quoted as saying by news agency ANI here. Demanding Jayant Sinha’s resignation, the Congress claimed his action reinforced the belief that the BJP was tacitly supporting those accused and convicted in such crimes.